Camino Santiago De Compostela, or Way of St. James, is one of the most famous long distance pilgrimage walks in the world. Its history is steeped in tradition of over a thousand years when pilgrims came to visit the final resting place of the Apostle who, as legend has it, was buried there in the 9th century after his martyrdom in the Holy Land. To complete the whole journey from beginning to end would see us cover a distance of over seven hundred and fifty km, a feat often accomplished these days without interruption, but only by those truly dedicated and with over five weeks to spare. Our challenge will be much more modest with a choice of two distances on the final journey into Santiago. The first is a walk of 87km from the town of Portomarin to Santiago, and the second is more strenuous, as it covers a longer distance in the same five days of walking. You will decide which walk best suits you. On arrival we will travel by private bus to Sarria, a journey of less than two hours. We will be brought to our hotel accommodation and can relax before meeting up again for our evening meal in a local restaurant. Our 1st days walk takes us from Sarria toPortomarin. 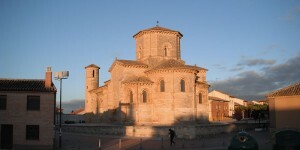 The centre piece of Portomarin is the church of San Nicolas which stands in the town square. It was dismantled in the 1950’s and reconstructed on higher ground when the original town was flooded to make way for a hydroelectric scheme. Leaving PortomarinWe cross the river over a narrow footbridge which leads to our path through forest and farmland. Remains of Pilgrim Hospitals and ruined churches can be seen along the way as we pass through small hamlets. There are opportunities for coffee and snack breaks along the way, and reaching our nights destination at ‘Palacium Rergis’ or Royal Palace is a welcome sight. Though Palas de Rei is said to be on the site of the original Roma road between Lugo and Astorga, there are no major remains within its limits. Today we journey through oak and pine forests and along the restored medieval road as we cross from the province of Lugo to La Coruna and on to Melide. It is primarily an agricultural market town, with engineering supplies and workshops for the farming community. We continue through much the same type of countryside and terrain, although the latter part of the journey sees us walking on quiet country roads as we make our way to Arzua. In medieval times, we would have collected a few stones from the quarries in Triacastela on our way to Sarria from the East and brought them to the furnaces at Castaneda, a few miles beyond Melide. 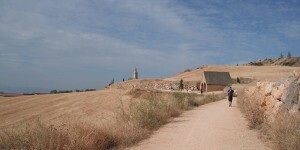 Here, the lime was produced for use in the construction of the Cathedral in Santiago. We pass the beautifully restored 15th century hostel at Ribadiso. Arzua is another fine town with a very pleasing square where we can sit with a drink and watch fellow ‘Pilgrims’ come and go as the locals go about their business. Our second last day’s walk sees us stroll through mixed countryside of pine and eucalyptus forest paths, wide open spaces and country roads. Watching the markers along the way, we can count down the distance yet to travel to Santiago, and very shortly we will be on the right side of twenty kilometres. We will stop for a late lunch at a busy roadside café and then its only forty minutes or so to our hotel, our final resting place before entering Santiago the following day. Whether you started from Portomarin, from Sarria or from further East, this is a significant day on your journey along the Pilgrim’s route to Santiago. The city is large, and this is reflected in the change of terrain as we approach the suburbs of our final destination. We pass through Labacolla, where tradition has it that “Pilgrims on their way to Santiago take of their clothes, and for the love of the Apostle, wash not only their private parts, or mentulas, but the dirt from their entire bodies.” We then pass by Monte del Gozo, or Mound of Joy, where early pilgrims were able to get their first glimpse of the city. “On seeing it, we fell to our knees and began to weep for joy and were unable to speak for the tears that streamed out of our eyes with such force that our hearts trembled and our continuous sobs interrupted our singing.” A few more km, and we enter the outskirts of the city, finally arriving at the Praza do Obradoiro, on which stands the Cathedral. A ten minute walk sees us at our hotel for a rest, a shower and change of clothes before exploring the city and all it has to offer for the rest of the evening and well into the night if you have the energy. The luxury this morning is that we don’t have to pack our bags and have them ready for collection. One of the highlights will be to go, along with pilgrims, walkers and visitors alike to the Cathedral at mid-day, be there at 11.30 if you want a seat, to watch the ceremony which culminates in the swinging of the giant Botafumeiro from side to side and which reaches a speed of almost 70km per hour. There is an endless list of historical buildings and sights to be seen, and many parks for a quiet moment for yourself after your journey. Most of all, you have time to explore on your own, enjoy. We will have one final meal together this evening in one of the city centre restaurants and a nightcap. After a late breakfast, our bus will collect us to bring us the short distance to Santiago airport for our flight home. Sarria to Santiago. Eight day trip with 110km walk over five days. Transfer from/to Santiago airport. Meeting point at information point in arrivals hall of Santiago airport on Saturday.